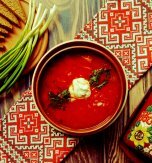 The entire world knows that one of the most popular dishes of the rich Ukrainian cuisine is a beetroot soup (borsch). 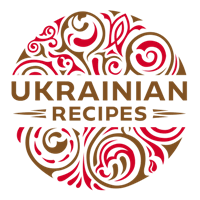 Each region of our country has its own recipe and all of them are incredible tasty. 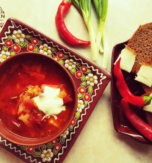 This recipe for borsch with dumplings comes from a marvelous Ukrainian city – Poltava. 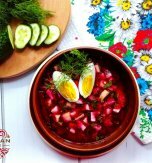 Such borsch is flavorful, nourishing, and has perfect combination of various vegetables and meat broth. 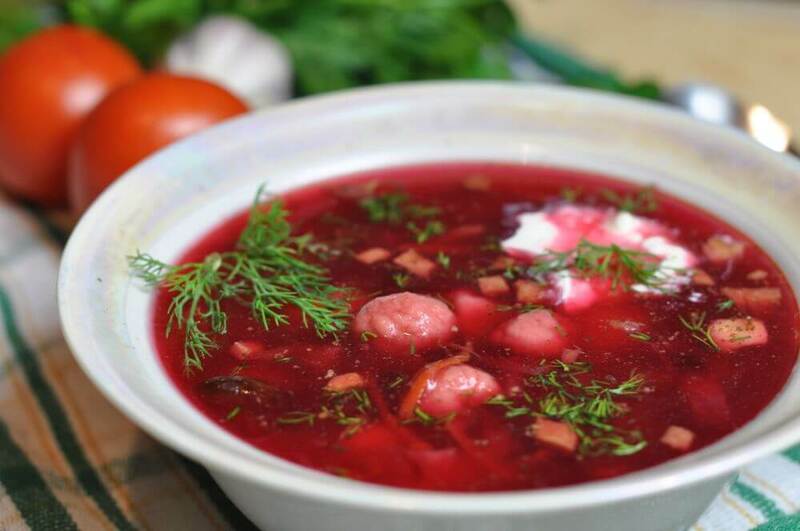 In addition, the soft dumplings served together with hot thick beetroot soup will give you the feeling of house and home. Peel a parsley root, wash it and cut into circles. Peel a celery root, wash and slice it. Cut a rooster into medium pieces, pour the meat with water and bring it to boil. Skim off the foam. Next add the roots and 1/2 tsp of salt. Stir the ingredients and boil them for 40-60 minutes. Peel an onion and chop it. Preheat 1 tablespoon of vegetable oil in a frying pan and fry the onion over medium heat till translucent. Add the onion to the broth. Peel a carrot, wash and chop the vegetable. Preheat 1-2 tablespoon of vegetable oil and brown the carrot till golden. Add the carrot to the broth and cook it 15 minutes more. Peel a beetroot, wash and slice it. Wash and chop cabbage. Peel, wash and dice potatoes. Transfer the meat from the pan to a plate. Add the beetroot to the broth, bring it to boil and cook for 10 minutes. Add the chopped cabbage and bring the mass to boil again. Add the potatoes and boil the ingredients over low heat for 15-20 minutes. Add the tomato paste at the end of boiling. 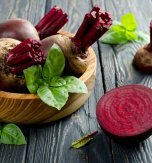 Remove the beetroot soup from heat and leave it for 5-10 minutes. Chop parsley. Place flour in a bowl and pour boiling water above. When it cools a little, beat an egg, add it and knead the dough. Bring water to boil in a separate pan and salt it. Deep a tablespoon in water, then fill it with the dough and place the spoon in a pan with boiling water. Repeat the procedure till you use all the dough. Boil the dumplings for 10-15 minutes. Place the prepared dumplings in a separate bowl. Pour the beetroot soup in a bowl plate. Add a piece of meat and some dumplings. Top the dish with chopped dill and serve it with sour cream.